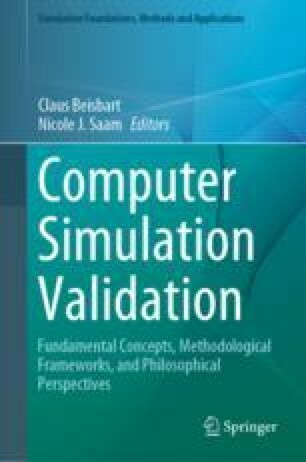 This chapter introduces concepts and principles associated with the verification and validation of simulation models, mainly in the context of models of complete systems. The word ‘verification’ is used here to describe testing processes to establish whether a computer-based representation correctly describes the underlying mathematical, logical and theoretical structure of the model. The word ‘validation’ is used to describe procedures for establishing whether the model fidelity is adequate for the purposes of the given application. Verification is internal to the model and the computer-based representation while validation processes involve information external to the model, normally using data or observations from the corresponding real system. The goal of the testing process for a simulation model must always be to establish the extent to which a model has the quality and credibility required for the intended application. These model testing processes, involving both verification and validation, are inherently iterative. Gore, R., & Diallo, S. (2013). The need for usable formal methods in verification and validation. In R. Pasupthy, S.-H. Kim & A. Tolk et al. (Eds.) Proceedings of the 2013 Winter Simulation Conference (pp 1257–1268). Washington DC: IEEE. https://doi.org/10.1109/wsc.2013.6721513. Kuhn, D. R., Chandramouli, R., & Butler, R. W. (2002). Cost effective use of formal methods in verification and validation. Invited paper, Presented at Foundations’02 Workshop, US Department of Defense, Laurel, Maryland, October 22–23, 2002. Retrieved from http://csrc.nist.gov/staff/Kuhn/kuhn-chandramouli-butler-02.pdf. The Mitre Corporation. (2014). Verification and validation of simulation models. In Mitre systems engineering guide (pp 461–469). Bedford: The Mitre Corporation. www.mitre.org/publications/technical-papers/the-mitre-systems-engineering-guide. Winsberg, E. (2018). Computer simulations in science. In E. N. Zalta (Ed. ), The stanford encyclopedia of philosophy (Summer 2018 Edition), forthcoming. https://plato.stanford.edu/archives/sum2018/entries/simulations-science/.